A 4.9 percent uptick in residential construction jobs may signal lower home prices ahead. After a string of less-than-stellar jobs reports earlier this summer, it seems that things are turning around for buyers just in time for the beginning of the fall buying season. The July 2017 Employment Situation Summary from the Bureau of Labor Statistics (BLS) shows that total non-farm payroll employment rose by 209,000 jobs last month and that the market saw a boost in residential construction jobs after four consecutive months of decline. The unemployment rate is at 4.3 percent and the number of unemployed persons at 7 million, which is essentially unchanged from previous months. Realtor.com Chief Economist Danielle Hale says she’s excited about the steadfastness of the current job market that will hopefully lead to increased confidence amongst non-owners who are looking to buy. “Today’s strong jobs report showed some good news,” said Hale in an emailed statement. “A strong job market and extra dollars in the pockets of many workers should further bolster consumer confidence in the current economic situation and outlook. “This is particularly important for homebuyers, who often finance their purchase over 30 years and are most likely to buy when they have a good job today and see strong prospects in the future,” she added. This is a bit of a turnaround from her thoughts on the June jobs report, where she expressed concern that jobs growth wouldn’t be enough to keep up with skyrocketing home prices. “Continued labor market health and additional spending power for workers is good news for the housing market, but even with the higher weekly earnings growth seen in June, home prices continue to outpace income growth,” Hale said of the June report. The change in Hale’s assessment of what the jobs report means for the real estate market may be due to the much-needed boost in construction that she called for last month. This month, residential construction jobs grew by 4.9 percent, something Hale says should “tame home price increases” and increase the number of for-sale homes. In July the pool of unemployed individuals was unchanged at 7 million. Adult men and women experienced 4.0 percent unemployment, unchanged from June. Teenager unemployment dipped 1 percentage point to 13.2 percent. 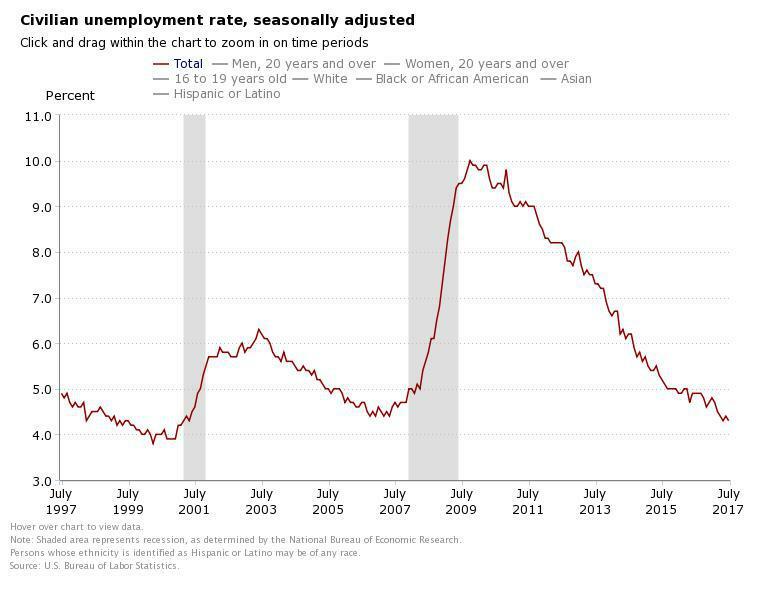 Black unemployment rates increased 0.3 percentage points to 7.4 percent. Asian unemployment rates increased 0.2 percentage points to 3.8 percent. Hispanic unemployment rose 0.3 percentage points to 5.1 percent. White unemployment was unchanged at 3.8 percent. The number of long-term unemployed individuals remained stable in July at 1.8 million, making up 25.9 percent of the unemployed total. The labor force participation rate (62.9 percent) and the employment population ratio (60.2 percent) remain essentially unchanged from June but are 0.4 percent above July 2016. Workers employed part-time for economic reasons — in other words, individuals who would prefer to find full-time employment — is unchanged at 5.3 million. Last month, there were 1.6 million people considered marginally attached to the labor force, meaning they are available for work and want a job, but are not currently in the labor force. This is down by 321,000 from July 2016. The number of discouraged workers, who have indicated that they are not looking for work because they do not believe jobs are available for them, is at 536,000 — unchanged from last year. The BLS surveys approximately 146,000 businesses and government agencies each month as part of its Current Employment Statistics (CES) program. These businesses and agencies represent approximately 623,000 individual worksites, and the CES collects data on employment, hours and earnings of workers on nonfarm payrolls.